Everybody needs to get some fresh air every once in a while. Even, uh, robots. 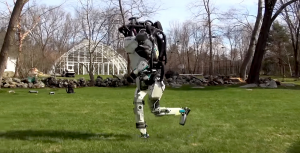 Needless to say, Boston Dynamics’ robots are getting pretty damn good at crossing all kinds of terrain, and doing every-day human stuff. And all by themselves now, relying on battery power, instead of having to rely on external power sources. They can leap, open doors, and sustain some serious physical (and psychological) abuse. Let’s just hope they don’t hold grudges. In a second video, Boston Dynamics shows off its SpotMini robot walking along a pre-defined path through a warehouse — fully autonomously, without any extra help. The camera follows it as it makes its way along a specified route through Boston Dynamics’ offices and lab facility. Sensors on its front, back, and sides interpret the physical world around it in real-time to help SpotMini situate itself. All it had to go on was depth data collected from a previous tour. It’s only a matter of time until videos of engineers being enslaved by their robot captors, appear on YouTube. Unfortunately, even running away from them won’t help you much now.